A great native shrub or ground cover plant, Leucophyta brownii is commonly called the Cushion Bush. 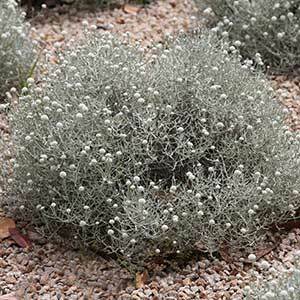 It forms neat little rounded clumps and has great silvery grey foliage. 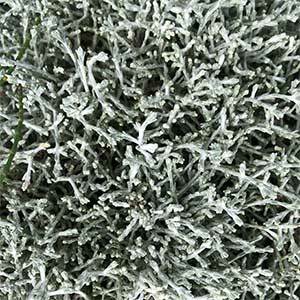 It is drought tolerant, grows well in poor soils and is also low maintenance. Growing naturally in exposed coastal areas from Western Australia through to Victoria and also in Tasmania, it can be found growing in all sorts of difficult situations. Some of the the Tasmanian forms are lower growing and will reach only 30 – 40 cm in height. Leucophyta brownii ‘Silver-Cloud’ is a recommended variety. Given lots of sun and a well drained soil, the Cushion Bush is almost indestructible, all you need to do is leave it alone. Simply plant it, water it in, take care of it over the first summer and that is it. It should not be pruned as this will ruin the shape. And it will not need fertiliser except in the poorest of soils. You can also propagate from cuttings.